Endostar, Lung cancer, VEGF, Circulating endothelial cells, Endostatin. At present, malignant tumor is one of the most common diseases that we must face. In the treatment of malignant tumors, operation is generally preferred in the early stage while chemotherapy is the main treatment method in the late stage. With the therapeutic effect failing to be ideal, oncologists are constantly seeking new treatments. In 1971, Folkman  proposed the hypothesis that the growth and metastasis of tumor depended on neovascularization. Angiogenesis is a complex process regulated by many factors with such promoting factors as Vascular Endothelial Growth Factor (VEGF), Fibroblast Growth Factor (FGF), angiogenin, Epidemal Growth Factor (EGF), IF8 and Tumor Necrosis Factor (TGFa) [2-4]. Vascular Endothelial Growth Factor (VEGF) together with its receptor is one of the most important angiogenic factors . Endostatin is widely included in various body tissues, especially in vascular wall and other basement membrane areas. Endostatin can inhibit the proliferation and migration of endothelial cells, hinder the angiogenesis of tumor, block its blood supply and inhibit its growth to reduce the tumor to a dormant state and finally to apoptosis . Circulating Endothelial Cells (CEC) are the Vascular Endothelial Cells (VEC) measured in peripheral blood, whose changes in number can reflect extent of vascular endothelial damage. It is currently the only to serve as the direct and specific marker in biotic tissues to reflect VEC damages . Endostar is the recombinant human endostatin injection independently and innovatively developed by our domestic scholars and has been approved to successfully list as the first in similar global products. Its mechanism is to inhibit the formation of new blood vessels by hindering endothelial cell migration which promotes vascular formation, block the nutritional supply and thereby inhibit tumor proliferation or metastasis. This research aimed to study the impact of endostar bolus infusion combined with chemotherapy on serum VEGF, circulating endothelial cells and endostatin levels of patients with SCLC to provide a theoretical basis for endostar therapy in the treatment of SCLC. From January 2011 to December 2014, 30 cases pathologically diagnosed as malignant patients of III and IV stages were randomly divided into chemotherapy group, Endostar conventional infusion combined with chemotherapy group and Endostar bolus and sequential continuous infusion combined with chemotherapy group in each group with 10 patients. The subjects were selected from Department of Oncology of Dongying People's Hospital; Shandong from January 2011 to December 2014 and they were all pathologically diagnosed to have malignant tumor of III and IV stages. Inclusion criteria: patients with primary treatment; patients with ECOG score ≥ 2; patients with objective lesions of CT or ultrasound measurement; patients with normal blood routine, liver, kidney and heart function; patients with the estimated time of survival ≥ 3 months; patients with good compliance; patients voluntary to accept treatment plan of Endostar combined with chemotherapy. Patients with insufficient function of liver and kidney or suffering from serious cardiovascular and cerebrovascular diseases such as coronary heart disease, angina, myocardial infarction, arrhythmia, cerebral infarction, cerebral hemorrhage without the tolerance of thoracoscope and chemotherapy; patients with history of mental disease which is not easy to control; patients with uncorrected hemorrhagic disease; patients believed by the researchers to be unsuitable for participation. Chemotherapy group: Patients were given chemotherapy without other treatment. The routine infusion of endostar combined with chemotherapy group: c, that is: 7.5 mg/m2, infusion of 4 h, d 1-14. Endostar bolus and sequential continuous infusion combined with chemotherapy group: patients were treated with chemotherapy combined with Endostar with the Endostar usage as follows: a rapid infusion of 15 mg was given at first followed by a continuous infusion of 150 mg for 240 h. The patients in three groups were given antiemetic treatment and support at the same time. Each of them was required to complete at least two cycles of chemotherapy, toxicity was evaluated after a cycle and efficacy was assessed after two cycles. The patients were visited every 4 to 8 w for evaluation of efficacy and safety. Follow-up contents: ECOG score, imaging examination (chest enhancement CT, magnetic resonance DWI +ADC, PET-CT), laboratory tests (including: blood routine, tumor markers, etc.). Abdominal imaging examinations were performed every 4 to 8 w or when the researchers considered it necessary, including abdominal and liver adrenal ultrasound, whole body bone scan and brain MRIs when necessary. Examination methods and parameters should be consisted to assess the state of the tumor. Concomitant treatment and adverse events throughout the treatment were recorded. Measurement data was described as mean ± SD. χ2 test and ttest were applied respectively for the comparison of count data and means, SNK-q test was applied for factor analysis of variance, Spearman for correlation analysis, binary logistic regression analysis for RSR multivariate analysis with statistical significance of P<0.05. Statistical software: IBM SPSS 17. 0 and Microsoft office excel. From January 2011 to December 2014, 30 cases pathologically diagnosed as malignant patients of III and IV stages were randomly divided into chemotherapy group (Group A), Endostar conventional infusion combined with chemotherapy group (Group B) and Endostar bolus and sequential continuous infusion combined with chemotherapy group (Group C). There was no significant difference in general clinical features like age, gender, tumor stage and lymph node metastasis among patients in three groups (P>0.05, Table 1). Table 1: The comparison of clinical features between the two groups. Before treatment, there was no significant difference in serum VEGF levels between the 3 groups (P>0.05). 4 w after treatment, the VEG level of patients in group C decreased, but there was no significant difference compared with group A and B (P>0.05). After the treatment for 8 and 12 w, the VEGF of patients in group C significantly decreased and the difference was statistically significant compared with the other two groups (P<0.05, Table 2 and Figure 1). Table 2: Comparison of serum VEGF in 3 groups before and after treatment. 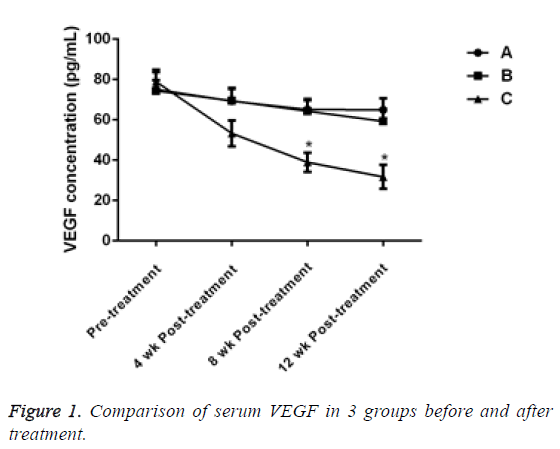 Figure 1: Comparison of serum VEGF in 3 groups before and after treatment. Before treatment, there was no significant difference in ES levels in 3 groups (P>0.05). After treatment for 4 w, 8 w and 12 w, the ES level of the patients in groups B and C significantly increased and the difference was statistically significant compared with that of the patients in group A, (P<0.05). ES level in group C significantly increased and the difference was statistically significant when compared with group B (P<0.05, Table 3 and Figure 2). Table 3: Comparison of ES in 3 groups before and after treatment. 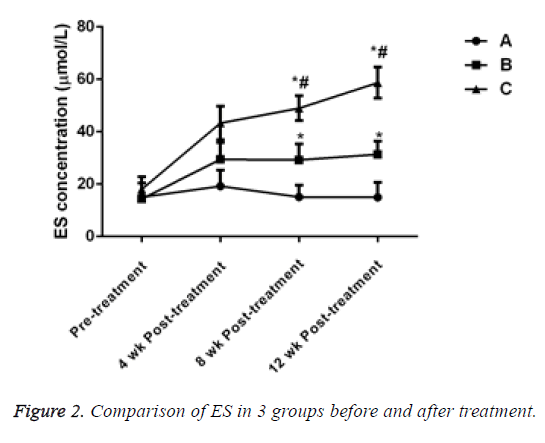 Figure 2: Comparison of ES in 3 groups before and after treatment. Before treatment, there was no significant difference in the level of Circulating Endothelial Cells (CEC) between the 3 groups (P>0.05). 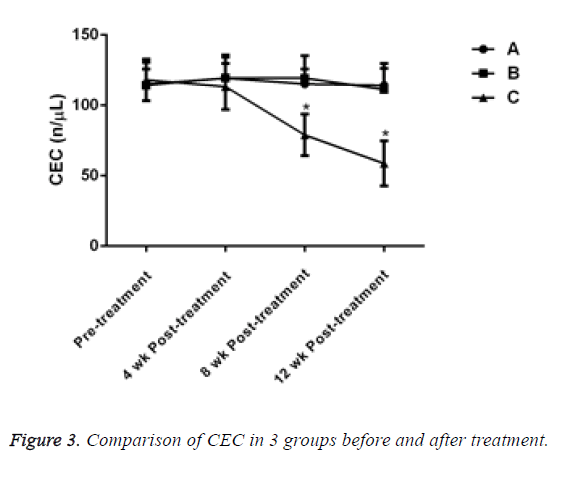 After 4 w of treatment, the CEC of patients in group C decreased, but there was no significant difference compared with groups A and B (P>0.05). After treatment for 8 and 12 w, the CEC of patients in group C decreased significantly and compared with the other two groups, the difference was statistically significant (P<0.05, Table 4 and Figure 3). Table 4: Comparison of CEC in 3 groups before and after treatment. Figure 3: Comparison of CEC in 3 groups before and after treatment. Malignant tumor is a systemic and systemic disease with multiple factors involved in the development. Since where there is malignant tumor, there is neovascularization with the latter serving as morphological basis in the process of tumor development, anti-angiogenesis therapy and Angiogenesis Inhibitor (TAI) have become hot in treatment of malignant tumors in recent years. Tumor growth and metastasis depend on neovascularization. When tumor size is more than 1-2 mm3, its growth depends on angiogenesis. These new blood vessels offer tumors abundant nutrients and tumor, using angiogenesis as transfer mode, transports primary cancer cells to target organs through blood circulation, thus making micro metastasis become possible. Angiogenesis is a complex process regulated by many factors with such promoting factors as Vascular Endothelial Growth Factor (VEGF), Fibroblast Growth Factor (FGF), angiogenin, Epidemal Growth Factor (EGF), IF8 and Tumor Necrosis Factor (TGFa) [2-4]. Vascular Endothelial Growth Factor (VEGF) together with its receptor is one of the most important angiogenic factors. It can increase vascular permeability and promote tumor angiogenesis, therefore playing an important role in the proliferation and migration of tumor vascular endothelial cells. In 1997, O 'Reilly and Folkman et al. found that ES (Endostatin) was widely present in various body tissues body tissues, especially in vascular wall and other basement membrane areas. Endostatin can inhibit the proliferation and migration of endothelial cells, hinder the angiogenesis of tumor, block its blood supply and inhibit its growth to reduce the tumor to a dormant state and finally to apoptosis. ES showed strongly specific function of inhibiting the proliferation of vascular endothelial cells in vivo and in vitro [8,9]. It makes effects on Vascular Endothelial Growth Factor Receptor (VEGFR), prevents the connection of VEGF with endothelial cells and directly blocks the effect of VEGF; What’s more, it can also down-regulate the expression of VEGF mRNA and protein and directly block the signal transduction of VEGF receptor, thus inhibiting VEGFmediated migration and angiogenesis of endothelial cells . Circulating Endothelial Cells (CEC) are the Vascular Endothelial Cells (VEC) measured in peripheral blood, whose changes in number can reflect extent of vascular endothelial damage. It is currently the only to serve as the direct and specific marker in biotic tissues to reflect VEC damages and it increases in number on the condition of inflammation, immune response, infection, tumor formation and cardiovascular disease . Study by Francesco Bertolini’s group  showed that CEC in the peripheral blood of some cancer patients was increased compared with that of the healthy and the CEC of cancer patients with complete remission was reduced to the normal level. Endostar is the recombinant human endostatin injection independently and innovatively developed by our domestic scholars and has been approved to successfully list as the first in similar global products. Also, it was recommended as the first-line treatment drug by NCCN Clinical Practice Guidelines in Oncology (NCCN Guidelines) Non-Small Cell Lung Cancer (Chinese version) in 2006. Its mechanism is to inhibit the formation of new blood vessels by hindering endothelial cell migration which promotes vascular formation, block the nutritional supply and thereby inhibit tumor proliferation or metastasis. It can block integrin of endothelial- α5β1 (Integrin is a cell adhesion molecule in angiogenesis), and show its antiangiogenic activity by blocking endothelial selectin . In addition, it is able to block the activity of MMP-2, MMP-9 and MMP-13 [14,15] becomes a kind of multiple angiogenesis inhibitor. The results of this study showed there was no significant difference in serum VEGF and CEC between the 3 groups before treatment. After 4 w of treatment, the endostatin of patients increased while VEGF and circulating endothelial cells decreased in group C, but the difference was not statistically significant compared with groups A and B. 8 and 12 w after treatment, the endostatin of patients in group C increased significantly while VEGF and circulating endothelial cells strikingly decreased, and compared with groups A and B, the difference was statistically significant. The above results suggest that the treatment of Endostar bolus and sequential continuous infusion combined with chemotherapy can effectively reduce the level of VEGF and CEC in patients with small cell lung cancer compared with the treatment method of chemotherapy and endostar conventional infusion combined with chemotherapy. But it takes some time to produce this kind of efficacy. The study results showed a statistically significant difference the eighth week after treatment. In addition, the results of this study showed that after treatment for 4 w, 8 w and 12 w, the ES level of the patients in groups B and C significantly increased and the difference was statistically significant compared with that of the patients in group A. And ES level in group C significantly increased of statistical significance when compared with group B. The above results indicate that the treatment of Endostar bolus and sequential continuous infusion combined with chemotherapy can enhance the ES level of patients with small cell lung cancer far more effectively. To sum up, with the treatment of Endostar bolus infusion combined with chemotherapy, endostatin of patients with small cell lung cancer increases significantly while VEGF and circulating endothelial cells decrease sharply, suggesting that Endostar bolus infusion combined with chemotherapy has direct inhibitory effect on neovascularization of SCLC tumor tissues, worthy of wide application and promotion in clinical practices. Folkman J. Tumor angiogenesis: therapeutic implication. N Engl J Med 1971; 285: 1182-1186. Arjaans M, Schroder CP, Oosting SF, Dafni U, Kleibeuker JE, de Vries EG. VEGF pathway targeting agents, vessel normalization and tumor drug uptake: from bench to bedside. Oncotarget 2016; 7: 21247-21258. Radulescu RT. The nucleocrine pathway comes of age. Rom J Morphol Embryol 2015; 56: 343-348. Gacche RN, Meshram RJ. Targeting tumor micro-environment for design and development of novel anti-angiogenic agents arresting tumor growth. Prog Biophys Mol Biol 2013; 113: 333-354. Walia A, Yang JF, Huang YH, Rosenblatt MI, Chang JH, Azar DT. Endostatins emerging roles in angiogenesis, lymphangiogenesis, disease, and clinical applications. Biochim Biophys Acta 2015; 1850: 2422-2438. Manzoni M, Comolli G, Torchio M, Mazzini G, Danova M. Circulating endothelial cells and their subpopulations: role as predictive biomarkers in antiangiogenic therapy for colorectal cancer. Clin Colorectal Cancer 2015; 14: 11-17. Reilly MS, Holmgren L, Shing Y. Angiogenesis: A novel angiogenesis inhibitor that mediates the suppression of metastase by a Lewislung carcinoma. Cell 1994; 79: 315- 328. Wang ZH, Zhu ZT, Xiao XY, Sun J. Correlation of serum levels of endostatin with tumor stage in gastric cancer: a systematic review and meta-analysis. Biomed Res Int 2015; 623939. Sakurai T, Kudo M. Signaling pathways governing tumor angiogenesis. Oncology 2011; 81: 24-29. Rosca EV, Koskimaki JE, Rivera CG, Pandey NB, Tamiz AP, Popel AS. Anti-angiogenic peptides for cancer therapeutics. Curr Pharm Biotechnol 2011; 12: 1101-1116. Ge YZ, Wu R, Lu TZ, Xin H, Yu P, Zhao Y, Liu H, Xu Z, Xu LW, Shen JW, Xu X, Zhou LH, Li WC, Zhu JG, Jia RP. Circulating endothelial progenitor cell: a promising biomarker in clinical oncology. Med Oncol 2015; 32: 332. Bertolini F, Shaked Y, Mancuso P, Kerbel RS. The multifaceted circulating endothelial cell in cancer: towards marker and target identification. Nat Rev Cancer 2006; 6: 835. Fummatsu T, Yamaguchi N, Nishida K. Endostatin inhibits adhesion of endothelial cells to collctgen I via alpha(2) beta(1) integrin, a possible cause of prevention of chondrosarcoma growth. J Biol Ehem 2002; 131: 619626. Na L, Yun L, Ying G. Endostar suppresses invasion through downregulating the expression of matrix metalloproteinase-2/9 in MDA-MB-435 human breast cancer cells. Exp Biol Med 2008; 233: 1013-1020. Rong B, Yang S, Li W, Zhang W, Ming Z. Systematic review and meta-analysis of Endostar (rh-endostatin) combined with chemotherapy versus chemotherapy alone for treating advanced non-small cell lung cancer. World J Surg Oncol 2012; 10: 170.